What is the church? What is the essence of the Christian faith? In one, after a church service last Sunday, an older man enthused joyfully to me how he loved this church. After decades of mostly bad church experiences, this was a place of inclusion, welcome, respect and acceptance. A community that was like a family to him. In the other, a group of people met at our home – agenda, decisions etc – and as they left it struck me how close we were – like a bunch of brothers (for they all happened to be men). Brothers who had different personalities and opinions and perspectives, but who ‘belonged’ to each other at a fundamental level. This links to the place of love in Paul’s ethics. Take the problematic bunch of ex-pagans in Corinth: pride, arrogance, jealousy, division, condescension – they were leaders in the field. Paul’s response in 8-11 is to picture the church as a building under construction. While arrogance, based on a puffed up opinion of one’s knowledge, leads to destruction of the building (arrogance wreaks relational havoc), love builds up (8:1). The central place of love in his ethics puts Paul at odds with the rest of the ancient world. And he gives two images of the sort of love that is at the core of Christian faith. For Paul the new community of the Spirit brings believers into a fundamentally new identity: a common Father, a common Lord, a common experience of the Spirit. They now belong together in a new ‘household’ – the household of God. There is ‘brother’ language all over the place in 1 Cor. 8 and the issue of whether to eat food offered to idols. For example, those with ‘knowledge’ are to use it responsibly, carefully, lovingly with regard to their (weaker) brothers to that they would be built up not torn down. If they use it to serve themselves, insist on their ‘rights’, or dismiss those with whom they disagree, they may think they win the argument but will ‘destroy’ their brother (and the community) in the process. This is why Paul peppers the letter with telling questions like ‘Do you not know?’ Their use of knowledge shows they don’t actually know much at all. One of our students, from a different culture – naturally and joyfully calls others in IBI ‘brother’ or ‘sister’. For her they are not just words, but a deep theological orientation and praxis that the church is a community of brothers and sisters. Language matters; spoken truth makes a difference. Saying ‘brother’ or ‘sister’ is a speech-act that teaches and incarnates truth. I don’t think it is any co-incidence that we in the West tend to shy away from such language – or use it ironically. We minimize church as family. We are individuals first who might (or might not) add ‘church’ to our busy lives. We easily divide and ‘leave’ family behind – as if we are not really related at all. The cross is the second image that gives form to Christian love. A fellow believer is not only a brother or sister, for one for whom Christ died (1 Cor 8:11). Christian love is self-sacrificial, a giving up of one’s own rights for the good of the other. And the whole of 1 Corinthians 9 is Paul’s extended application of this principle in his own apostolic ministry. Church and ministry is not about the self – our own agendas and ambitions and achievements. So … while our wee church has plenty of faults and weakness I’m sure, I’m encouraged that familial love, sacrificial love, is not just an ideal, it is present and real. I’m also encouraged to see deep bonds of love being formed at IBI between students of all sorts of different ages, churches and cultures. I hope it is in your experience as well. Feel welcome to share a story..! In fact, as I reflect on being a Christian for over 30 years, this for me is the first and most essential ‘mark’ of authentic Christian ministry. It is why ‘moral formation’ or ‘character’ or ‘Christian maturity’ – however you describe it – is in Scripture the primary ‘qualification’ for ministry. It’s why the relational track record of someone in ministry is of primary not secondary importance. And it’s why it sometimes astounds me that leaders who leave trail of relational destruction behind them can be massively popular. For without love, I’d go as far as saying that God is dusting off his prophetic word to Malachi and telling us it’s better we close down our churches and theological colleges for they do more harm than good. One of the best conferences I was ever at was the International Consultation on Evangelical Theological Education (ICETE) in Hungary in 2009. It was fascinating and humbling to meet leaders from all over the world and hear their stories of what God was doing, often in and through profound suffering, in their contexts – Africa, Asia, Latin America, Europe, Middle East. Theological Education (TE) is a challenging and complex task – but also a hugely rewarding one. Nothing is more exciting to see someone’s identity, thinking, and life transformed by engagement with the living Word. And then, through that life, to see other lives impacted for the gospel. This came back to me when the latest edition of Evangelical Review of Theology (ERT) landed on my desk this week. Most of the articles are addresses given at the subsequent triennial ICETE conference, this time in Kenya 2012. Since Kenya was too distant and expensive to get to, reading these papers was the next best thing! And they are good stuff – rigorous and creative reflections on the task of TE globally. This is no congratulatory back-patting, but searching self-questioning on how to see men and women transformed and equipped through the experience of doing theology in their own (very different) contexts. The theme of the conference was “Rooted in the Word: Engaged in the World”. Contributors include Chris Wright and others from different parts of the world. 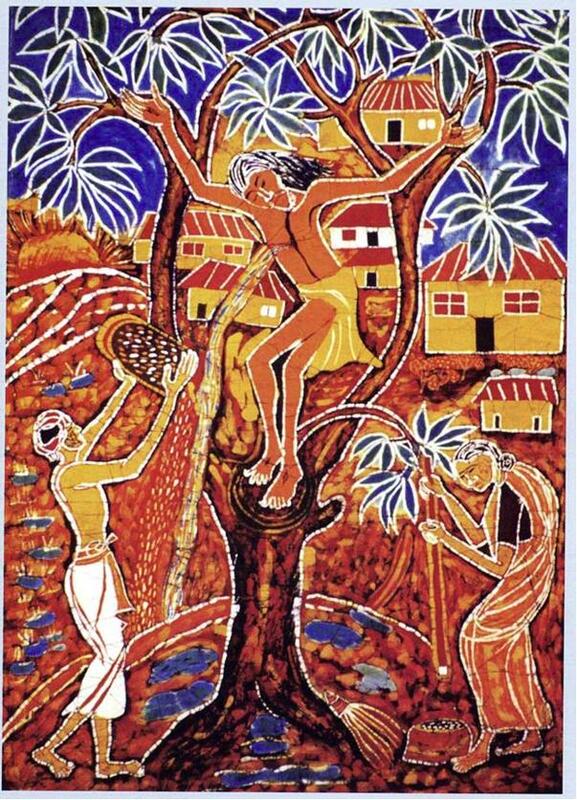 She uses this picture, drawn by two Catholic women artists from a village in South India. In the village, a certain species of tree is worshipped within animistic religion. The artists also make the tree central to worship, but it is Christ on the tree who is the object of worship. Her overall argument is the need creatively to ‘curry up’ how we read the Bible in engagement with our local context by greater awareness of what we do NOT teach (the null curriculum) and what we don’t realise we are teaching (the hidden curriculum). She tells a powerful story of reading the book of Ruth in dialogue with the appalling treatment of Hindu widows abandoned into prostitution and poverty by their families in the sacred city of Varanasi, on the banks of the Ganges. By teaching the book of Ruth with little or no contextual engagement in India, its message is not really heard or applied. But reading Ruth in dialogue with a documentary on Hindu widows, helped students to read Ruth in powerful new ways that are also fully consistent with the original radical message of that most wonderful of OT books. Without such contextual ‘sowing’ we will reap little. She returns to the image of the tree at the end of her article. All TE should be strongly rooted in the Word. [And Chris Wright’s article is a long and passionate exhortation for a deeply biblical form of TE]. But if TE stays there, it will be like a winter deciduous tree: still alive, growing, sap still being pumped, but withdrawn into itself. Bare and leaf-less. Not really engaged with the world outside. And what she says here can apply to any church just as much as TE. When a church becomes withdrawn, self-focused, serving only the needs and hopes and fears of its own members, it also is like a winter tree.